Move oven rack to lowest position. Heat oven to 375°F. Spray 12-inch pizza pan with cooking spray. In small bowl, stir Bisquick® mix, cornmeal and very hot water until soft dough forms. Place on surface sprinkled with Bisquick mix, gently rolling to coat. Shape into ball; knead about 5 times or until smooth. Roll dough into 10-inch circle; fold into fourths. Unfold on pizza pan. 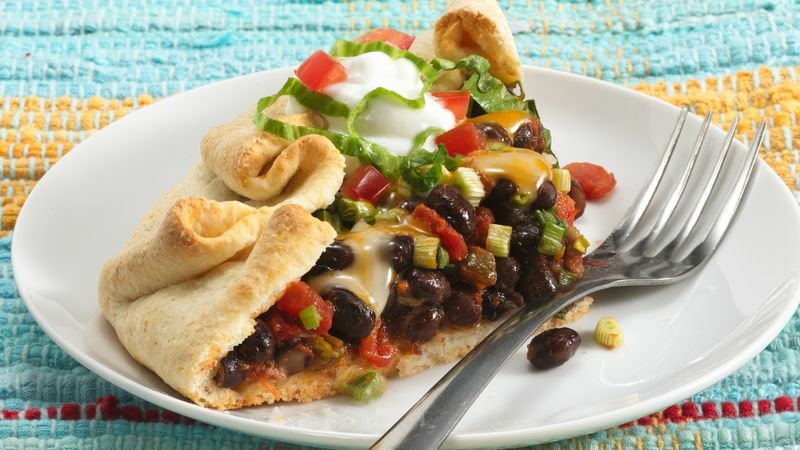 In small bowl, stir together beans and salsa; spread over dough to within 2 inches of edge. Sprinkle with onions. Fold edge over. Sprinkle cheese over beans. Bake 25 to 28 minutes or until crust is golden brown and cheese is melted. Top with remaining ingredients. ♥ The heart signifies heart healthy recipes that are low fat, low saturated fat and low cholesterol. Use your favorite reduced-fat cheese for the Jack cheese. Serve melon slices or another favorite fruit with the foldover. Toss leftover beans into soup or stew.